Take a virtual trip to Panda’s Fortune Slot and try to hit one of the three jackpot prizes! As you go on the hunt for some sensational wins, you will find its 5-reels adorned with some eye-catching symbols. On this 25 paylines online slot machine, you will be propelled into an Asian themed display packed with Chinese themed symbols. Did you know that the Panda is regarded as an auspicious symbol of friendship, harmony and peace? On that note, spin the reels of Panda’s Fortune Sot for some huge potential wins! Bring the fun of Panda’s Fortune Slot straight on the screen of your mobile, tablet and desktop devices. As you swirl the reels of this tantalising online slot, you will find gobs of symbols set against a bamboo-filled backdrop. To bring your experience to new heights, first set your betting options according to your preferences. Bet Levels: There are no Bet Levels on Panda’s Fortune Slot. Amount of Paylines Selection: There are 25 paylines! Coin Values: There are no coin values but you can set your bets as per your likes. The wild symbol on Panda’s Fortune Slot is the Panda eating bamboo and it can substitute all the symbols on the reels apart from the Bonus symbols. The wild symbol will crop up on these following reels: 2, 3, 4 and 5. There are the bonus symbols on Panda’s Fortune Slot. The bonus symbol is depicted by the yin and the yang symbol and if you get 3 or more of these symbols on these amazing reels, you will launch the Free Spins Feature. Five of these symbols will result to 100x total bet and a total of 15 Free Spins. If you get 4 of these bonus symbols this will bestow you with 15x your total bet and 10 Free Spins and finally, if you get 3 bonus symbols, you will be granted with 2x your total bet and 8 Free Spins. During the Free Spins Feature stacked Chinese red lantern symbols will pop up on the reels 2, 3, 4 and 5. Now, at the end of each free spin, all the Chinese red lantern on the screen will change into several symbols randomly such as the Panda, butterfly, playing cards – A, K, Q, J, 10 or 9, the Banzai, the lion, a frog and a fish. When the Free Spins Feature is activated, if you have 3 or more yin and yang bonus symbols, you will be awarded 5 or more Free Spins. No limits! As the free spin feature is triggered, special reels will be in play. We have some amazing news for you! 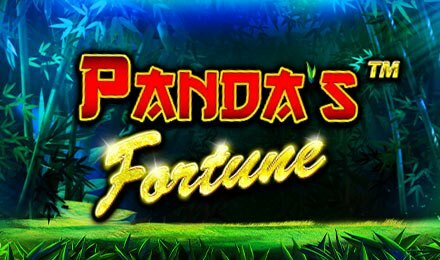 During the Free Spins Feature on Panda’s Fortune Slot, the Jackpot Feature is available. And guess what, you have a chance of landing one of 3 jackpot prizes namely: The Minor, Major or Grand jackpot. When it comes to the minor jackpot, you have to land a 5 of a kind winner that consists of a wild and a gold-edge sign on the reel. You will thus enjoy a mini jackpot that is worth 25x your stake. On the other hand, the major jackpot is bestowed by landing a 5 of a kind winner that includes one of the lower value symbols: A to 9 symbols, no wild symbols and a gold edged symbol located on the reel 5. You can enjoy 200x your stake. Last but not least, to hit the Grand Jackpot, you have to land a 5 in a row winner that is made up of one higher value bonsai tree symbol or animal symbols that don’t include the wilds plus a gold-edged symbol on reel 5. You will revel in 800x your overall stake.